Want to know how to avoid one of the biggest health dangers we’re facing today? I can tell you some of the top hiding places for this risky food substance. But, first, what is this big risk to your health? Added sugar has become public enemy #1 when it comes to good health. It’s just bad stuff, and in some cases can even be toxic. Your body isn’t meant to handle as much of it as you’re consuming, and the health complications of added sugar are numerous. Added sugar is a major cause of type 2 diabetes, obesity, and heart disease; it even plays a degenerative role in your immune system. What makes added sugar more dangerous is its unavoidable presence in the American diet. So many foods are packed with added sugars that they can be nearly impossible to avoid. So, yes; limiting your sugar intake is difficult, but it’s still doable if you have the inside scoop. Ketchup: A single tablespoon of ketchup has 4 g of added sugar. It might not sound like a lot, but who only consumes 1 Tbsp (tablespoon) per serving? Instead of loading up on ketchup for hamburgers and hotdogs, focus on adding flavor, using fresh veggie garnishes and mustard. Salad Dressing: One of the fastest ways you can turn a seemingly healthy meal into a sugary disaster is by adding a sweet dressing to it. Raspberry vinaigrette dressing, for example, can have 5-7 g of sugar per 2 Tbsp. And much like the ketchup conundrum, most people are far more likely to add more than 2 Tbsp of dressing to their salads. Scrap the sugar and get the full-value of a healthy salad by using a balsamic dressing. Pasta Sauce: Even savory items, like soup and sauces, can be filled with sugar. You might not think pasta sauce is a sweet treat, but half a cup of pasta sauce has 12 g of added sugar—the same amount as a chocolate chip cookie. Instead of buying canned pasta sauce, try making your own, without the sugar. Or even better: use pesto sauce and whole-grain pasta instead of white pasta. BBQ Sauce: There are 13 g of sugar in every two 2 Tbsp of BBQ sauce, and nobody is using 2 Tbsp—that single rib you just ate probably has twice that amount! 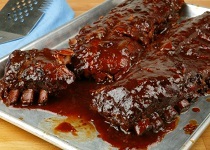 Instead of using BBQ sauce, opt for dry rubs and seasonings. I’ve even slow-cooked using water and vinegar to bring out the natural flavors of the meat. Yogurt: Not all yogurts are created equal. Fruit-added yogurt tastes just as sweet as a dessert pudding because it essentially is a dessert. There are about 19 g of sugar in a fruit-added yogurt, and about 14 g of that are added. Greek yogurt, on the other hand, has about 5 g of naturally occurring sugars. Dried Fruit: Dried fruit may seem like a healthy snack, but it really isn’t. When fruit is dried out, it essentially becomes straight sugar. Just 1/3 of a cup can have as much as 24 g of the sweet stuff. Sometimes there are added sugars, too. The main benefit of whole fruits is that they deliver sugar along with fiber. Fiber helps slow the absorption of sugar and helps the body stave off insulin spikes. When fruit is dried out, it loses this valuable fiber and its important health benefits. The same is true when fruits are converted to juice. The average American consumes about two to three times as much sugar per day as they should. Generally speaking, the average man should be getting about 150 calories or so of sugar per day, and the average woman about 100. There are variables like size and weight, but this is what’s generally recommended. Limiting your added sugar intake means becoming ingredient-literate. Foods that are branded “diet” and “low fat” are often loaded with added sugars to make up for removed fat. The sugars add the flavor and texture that people have become accustomed to. Reading labels is important in enabling you to avoid these hidden sugars. You want to look at the sugar content, as well as pay attention to words like “glucose,” “sucrose,” and “fructose,” as well as various syrups such as corn syrup and high-fructose corn syrup. The higher up on the ingredient list you see these items, the more of them there is. Don’t let food manufacturers successfully shorten your life span. Fight back against the ill effects of added sugars by reading labels and using fresh alternatives. University of Utah, “Fructose more toxic than table sugar in mice,” University of Utah web site, January 5, 2015; http://unews.utah.edu/news_releases/fructose-more-toxic-than-table-sugar-in-mice/.